Even fictional people have to eat. Sometimes food reveals what we should know about a character, sometimes it’s a pleasant pause in the action, sometimes it’s guacamole—made right here at the table! Food Fiction is an ongoing feature that looks at some of the most memorable foods in the history of storytelling. It seems straightforward to sit characters down at a table to color in their characters, or maybe breeze through some exposition over a cup of coffee or plate of random, unimportant prop food. It gives the actors some business to do with their hands—open menu, close menu, pick up coffee cup, stir coffee—and it’s a perfectly natural device, what with our biological imperative to grab a little something two or three times a day. They’re seated so that they’re looking right at each other, unlike dialogue staged in a car or during a long walk in Central Park, and the setup is perfect for a camera crew to grab the shot from a couple-three angles without intruding. If all the media attention devoted to this whole Seinfeld anniversary thing has been vaguely irritating or alienating for you because you never watched the show, the only couple of things you need to know to fully enjoy Jason Alexander’s monologue is that George frequently lies about having an interesting career in order to impress people, especially women he’s dating, and earlier in this episode Kramer hit 600 Titleist golf balls into the ocean. But if you’re a fan, even a mild one, odds are good you can quote huge swaths of that speech—certainly, at least, the first line about sending back soup. Pop quiz: Without going back and looking, what are they eating in that scene? What’s on the table? I’d remembered there being nothing—maybe a coffee mug or two. Since Elaine arrives mid-scene, maybe they haven’t ordered yet, but of course no server dares interrupt that speech. But there’s actually coffee all around and a plate of vaguely pasta-like stuff for Kramer—basically, a table full of incidental excuses to sit and talk. The food is so secondary in most Seinfeld diner scenes, it’s almost as if they deliberately set us up over the first three seasons so that in season four, our guards would be sufficiently lowered and we’d all be ready for the funniest squirt of ketchup in the history of filmed comedy. Seinfeld food moves from the background to foreground (double dipping, Junior Mints, chocolate babka, The Big Salad)—then back to the background at the diner until needed. Sitting and talking and eating and chewing and swallowing creates a familiar situation that’s full of minor distractions and opportunities for bits of business, creating a relaxed setting for great speeches to seem completely unrehearsed. Characters passing time together in a living room or bedroom or parked car changes the nature of the conversation—great speeches can be delivered anywhere, but in those non-table situations, the characters are somewhat deliberately choosing to remain together long enough to discuss something, and we’re subconsciously aware there’s nothing keeping them there. They could up and leave without much consequence, as opposed to abandoning a meal half-eaten, or uneaten, which makes a relatively big statement. “Having a talk” is serious, deliberate business—“Honey, sit down. I need to tell you something.” A meal just happens now and then. Gathered around a couple plates of ambiguously brown and green items, or a couple of drinks, the conversation occurs partly to fill the silence—and as a result feels unplanned, spontaneous, offhand, and maybe even more genuine as a result. DiCaprio does a great job in The Wolf Of Wall Street, but in his half of this scene there might be a slight whiff of script, of lines being read, as Jordan Belfort struggles to keep up with his new mentor. McConaughey appears to be making up everything in his entire world as he goes, including this speech about the necessity of self-pleasure and hedonism during the one-on-one chitchat of this business lunch—having the drinks and olives (“Chalkidiki?”) and waiter to play off, and the table to knock that cocaine vial against, helps McConaughey make it completely convincing he’s coked to the gills and improvising. Similarly, Joe Pesci delivers an amped-up near-monologue (also for Martin Scorsese) in Goodfellas at a restaurant table that doesn’t sound replicable—it certainly must have been choreographed, but it appears to be an unstable psychopath’s stream-of-consciousness reactions to the encouragement he’s getting from his laughing cohorts. It feels like a bunch of goodfellas went out for the night, and one guy at a restaurant just started telling stories and dominating the room. So many great scenes—and great writing—in movies and TV are just two or three actors parked at a table, passing the time. Or feeling time standing still, not passing at all. Or confronting each other emotionally. Or debating the meaning of pop songs. Or imitating genitalia and playing with their garnishes. What they’re eating is usually played down, if it’s even mentioned at all. Generally the food is just a theatrical property. In dramatic shows with complex plots, there’s a natural inclination to have characters sit and talk it out to help the rest of us keep everything straight, and to set up tense confrontations in a setting where it would be foolish for the antagonist to “try something.” Consider the polite conversation in Breaking Bad between Hank Schrader and Gus Fring at an inexpensively laminated table in Los Pollos Hermanos, Jesse wolfing Denny’s food even when tension and death are all around, family breakfasts, pizza delivery, coffee shops with artificial sweetener right there on the table, and that wonderful tableside guac scene that caused a spike in tableside guac sales at Garduño’s, the Albuquerque Mexican restaurant where the moment went down. Breaking Bad probably deployed talking and eating better, more often, and in more different ways than any other series. The characters are never more human than when they’re eating, and around tables is often where the series finds its funniest moments—even when they’re discussing literal life and death, or performing Machiavellian manipulations, or barely resisting having each other conveniently eliminated from the complicated plot. These meals are the crossroads of regular life and a meth empire. Obviously, if we were just making a list of scenes where characters sit and execute wonderful performances around tables, it would end up unmanageably long. It might start with Charlie Chaplin—who delivers the silent movie equivalent of a brilliant speech at a restaurant table, extemporizing “The Oceana Roll” that shows both us and the accompanying ladies that this is one clever, charming tramp who may be tongue-tied but should not be underestimated—and extend through something/anything recently reviewed on TV Club. But one dinner-table conversation stands out—a conversation that sounds, when you first learn of it, like an absurdist stunt or playwright’s experiment, and at first sets the expectation of a tedious lecture or stuffy intellectual’s idea of fun. This particular dinner, though, quickly proves how anxious we are to listen in on a conversation where interesting people who might say anything do nothing more than talk—My Dinner With Andre manages a dinner chat that holds viewers rapt for the duration of a feature-length film (not counting the pro- and epilogues), and there’s not one dull moment. It’s mesmerizing. And it’s “just” talking and eating. Nobody enjoyed it more than Gene Siskel and Roger Ebert. Those two thumbs were instrumental to the film’s success. Siskel and Ebert gave it such a shove, it entered our popular consciousness. 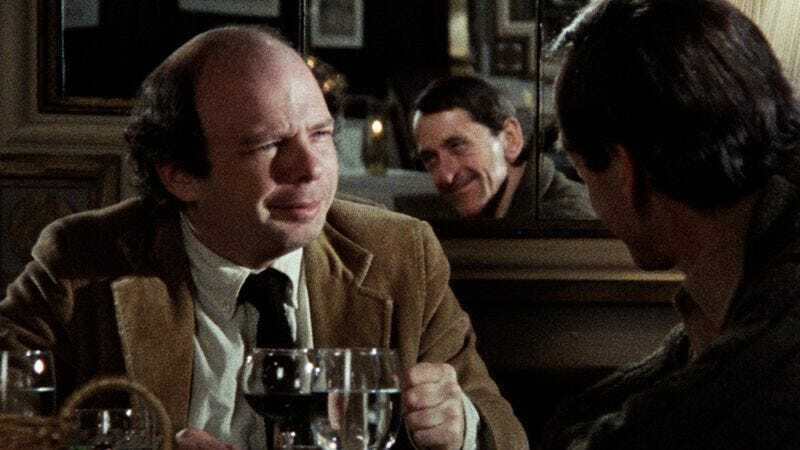 Eventually, through cultural references, people who have never actually watched Andre Gregory transfix and challenge Wallace Shawn can infer that there’s something kind of magical about the setup. Probably only a small percentage of fans of The Simpsons, Waiting For Guffman, and Community have watched My Dinner With Andre, but they all get the reference, and how the setup is sort of iconic and weirdly enthralling (and, yes, kind of self-consciously intellectual in that New York-in-the-1970s way). But to enjoy My Dinner With Andre only through parodies and references is, of course, like enjoying Star Wars by watching Spaceballs. It’d be a shame not to become completely wrapped up in the original; it’s worth it to understand not just the reference but why it’s worth a little fond satire. The movie works so well, it’s like watching a magic trick where you know what’s going to happen and enjoy it anyway. You end up delighted that you’re delighted. Of all the films Ebert loved, he wrote in 1999 that when someone asked him to think of a film entirely devoid of clichés, his answer was My Dinner With Andre. Ebert loved sitting around a table and talking—when he lost his ability to eat, he blogged about what he really lost: “…that’s what’s sad about not eating. The loss of dining, not the loss of food. It may be personal, but for me, unless I’m alone, it doesn’t involve dinner if it doesn’t involve talking. The food and drink I can do without easily. The jokes, gossip, laughs, arguments and shared memories I miss.” So of course he loved My Dinner With Andre. Maybe it’s not farfetched to imagine that he saw himself and Siskel in the characters—two people coming from very different backgrounds working through their own opinions live, in front of each other, apparently unrehearsed. Over dinner tonight you can debate whether Roger would be more similar to Wallace or Andre.